World hunger has existed for centuries. It persists, despite the elimination of apparent catalysts such as food production challenges. The phrase “trying to solve world hunger” has become shorthand to indicate any problem that seems insurmountable. The statistics are depressing. Every ninth person in the world is hungry, according to the World Food Programme. A staggering 800 million people in the world go to bed hungry every day, based on an estimated world population of 7.6 billion in December 2017. But the picture is not all grim. The number of hungry people in the world has shrunk by more than 200 million since the early 1990s, even given the substantial increase in global population, thanks to the concerted efforts of governments, world organizations, charities and local agencies. However, the goal of a hunger-free world still eludes us. The tragedy is that the world does produce enough food to feed every human on the planet - and more. In 2010, the world produced 20% more food than was needed to feed everyone, a 2016 study by Germany’s Potsdam Institute indicated. By 2050, this surplus is anticipated to grow significantly. Most countries and regions, even undernourished ones, produce raw surplus food. So why are 800 million people still hungry? Several different elements, including the purchasing power of hungry populations, contribute to this dilemma. But the absence of a globally efficient food distribution system is a key factor. 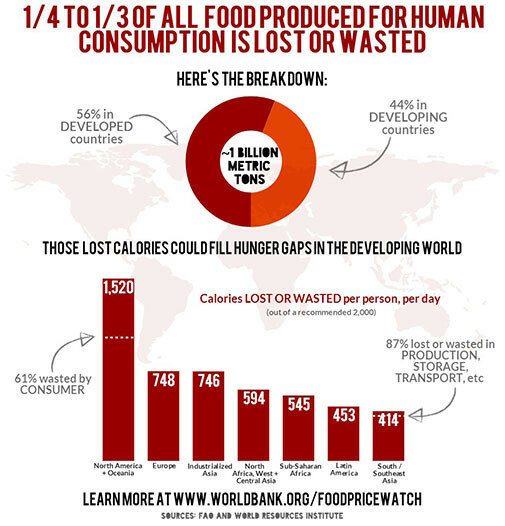 One third to one quarter of all the food produced for human consumption is lost or wasted, according to the World Bank. This is one billion metric tons of food every year. This has implications far beyond world hunger. If food waste were a country, it would be the third largest emitter of greenhouse gases after the US and China. Arresting the wastage problem and developing a sufficiently equipped food supply chain is of the utmost importance. Advances in Internet of Things (IoT)-related technologies can help eliminate key causes of food waste. They can boost related initiatives which are already underway and have produced promising results. The IoT can provide these programmes with real-time (or near real-time) data infrastructure for them to analyze their efforts, and help future investment and policy decisions. - Improve the yield from harvesting and storage. Up to 30 to 40% of production can be lost before food even reaches the market, the UN's Food and Agriculture Organisation (FAO) estimates. This is especially a problem in the developing world. The IoT can provide cost effective monitoring capabilities to inform farmers. Such data can help them choose the best methods for harvesting and storing produce, especially for crops subject to high losses like fruits and vegetables. - Improve the existing distribution network. In South and South-East Asia, almost 90% of wasted calories from food are lost during storage and transport, according to World Bank estimates. Even in developed countries, the IoT can make the distribution network more efficient and productive. It can provide better monitoring and access to real-time data for decision-making. For example, it can track cargo vehicles on the road, detect congestion and create alternate routes, and monitor conditions inside the containers. These are already viable commercialized technologies in deployment. - Leverage cost effective real-time data, harnessed from the cold chain infrastructure (temperature controlled supply chain needed for refrigerated products), with track and trace capabilities. It can enable a 24/7 monitoring system of perishable and sensitive food and generate alerts when an action needs to be taken (e.g. sensors indicating higher temperature than baseline in the containers, location trackers indicating higher traffic on roads). This helps to take preventive and precautionary actions at the right time reducing wastage and improving product quality. This can also ensure the food safety of commonly contaminated items and help avoid expensive product wastage and recalls. - Improve food purchase habits in affluent countries to minimize waste. Smart refrigerators can track food quantity and quality. They can send alerts or recommended purchase orders, even suggesting the quality of food to be bought based on usage patterns. - Extend the shelf life of produce. It can enable stores to sell foods that are still good for a longer period by enhanced detection through sensors. For example, all Danish supermarket chains already have a food waste reduction strategy. The IoT can make it exponentially more effective. - Enable surplus food to be shared. It can empower stores, hotels, restaurants and other typical food wastage hotspots to give food to local charities and other distribution programmes rather than throw it away. The IoT can disseminate information in real time to every stakeholder, making sharing more efficient. Solving world hunger is not only an ethical or humanitarian issue. It is strong correlated to global growth and prosperity. Hidden hunger can cost a country 1% of its annual GDP, a 2015 study by University of Nottingham suggested. Annual costs associated with child undernutrition cost several African countries more than 16% of national GDP, suggested another study. The opportunity is huge. Using fast-maturing IoT technologies can accelerate the end of one of humanity’s most tragic problems. What does self determination mean if you are hungry?